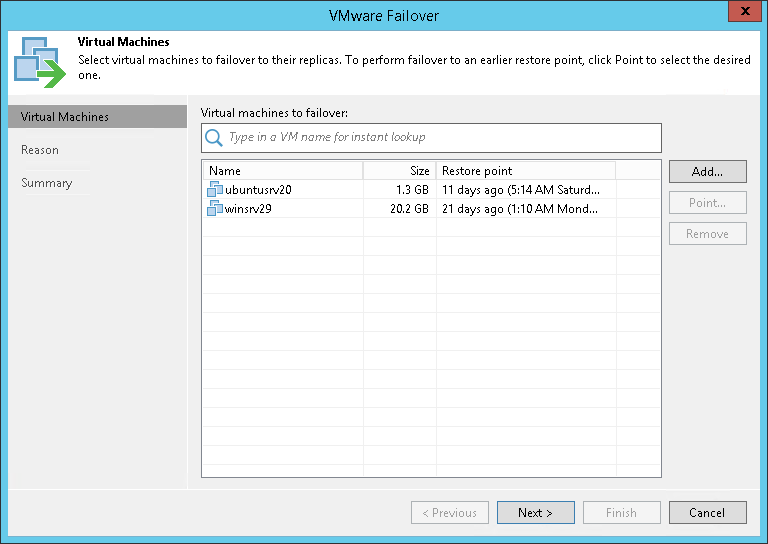 At the Virtual Machines step of the wizard, select one or more VMs for which you want to perform failover. You can perform failover for separate VMs and whole VM containers. From infrastructure — browse the virtual environment and select VMs or VM containers. If you choose a VM container, Veeam Backup & Replication will expand it to a plain VM list. From replicas — browse existing replicas and select VMs or VM containers under replication jobs. To quickly find VMs or VM containers, you can use the search field at the top of the wizard. Enter a VM or VM container name or a part of it in the search field. Veeam Backup & Replication will display possible matches. If the VM or VM container is not in the list, click the Show more link to browse the virtual infrastructure. Make sure that VMs you select from the virtual environment have been successfully replicated at least once.